Gladys Hooper of Britain dies at the age of 113. I don't feel much different than I did when I was 75"
Those were the words of the oldest person in Britain when she celebrated her birthday earlier this year. 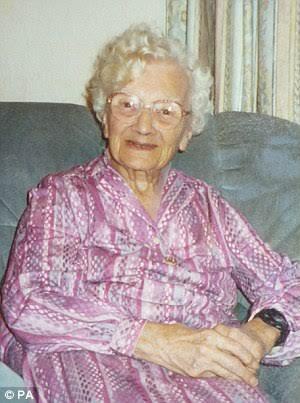 Britain's oldest person Gladys Hooper has died at the age of 113! Last year Mrs Hooper became a Guinness World Record breaker when she became the oldest person to ever have a hip replacement surgery. Leslie her late husband who was a pilot in the Flying Corps in the two world wars, married the resilient Gladys in 1922. Her son Derek Hermiston who is aged 85, confirmed that his mother passed away at the nursing home where she lived in Ryde on the Isle of Wight. Amazingly this 113 year old woman was born on the same year the aeroplane was invented! Gladys Nash on January 18, 1903, she was brought up in Rottingdean, Brighton, East Sussex, and went on to study at college. Later, she became a concert pianist in London, playing with several famous band leaders such as Jack Payne, Debroy Somers and Maurice Winnick. Apart from piano playing, she was a business woman. She started one of the first car hire companies in Britain and later ran Kingscliff House School, which went on to become Brighton College. Gladys celebrated her last birthday with some cake an a cup of tea.